On August 1st, we announced a public vote in partnership with the HiRISE team. It is your chance to decide which of the 3 regions we have featured on Planet Four in the first half of this year will have its first observation from the new HIRISE monitoring season prepared for public release by the HiRISE team. You can help determine which of one these 3 regions on the South Pole will have its first observation of the Season 5 HiRISE monitoring campaign prepared for public release. Below is the breakdown of the tallied votes as they stand right now. 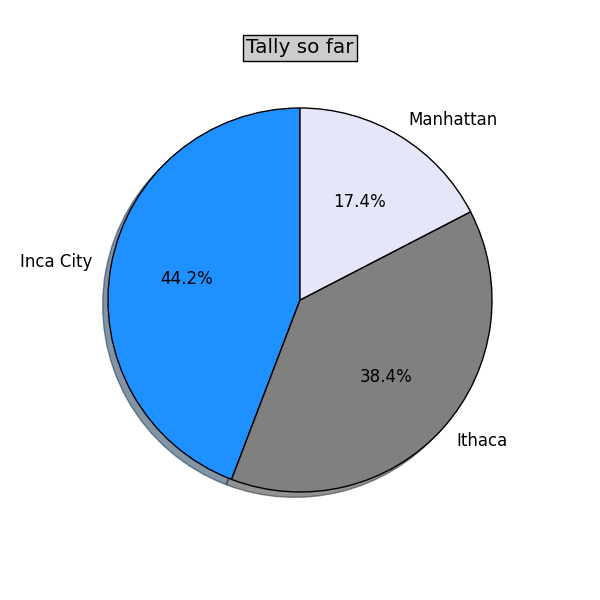 Inca City has the lead with Ithaca trailing not that far behind in second. Manhattan is a distant third.